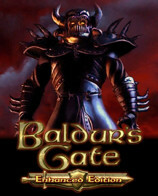 Since its initial release in 1998, Baldur's Gate has entertained millions of fans around the globe and has received countless awards. This classic saga of mystery, intrigue, and adventure has set the standard for Dungeons & Dragons computer roleplaying games ever since. Chaos threatens to overwhelm the Sword Coast. The state of Amn is under siege to the south, the High Moor is being overrun in the north, and the region around Baldur's Gate is in turmoil. In an area known for its ample resources, a crippling shortage is slowly developing for the metal that is used throughout the Realms for everything from swords to forks--iron. When iron ore reaching the region is smelted, the resulting wares are plagued with brittleness such that they crack and break with little more than normal use. What is worse, trading caravans coming from all directions into Baldur's Gate are under constant attack from bandits and cutthroats who loot not for gold and gems (although they often take those too), but for iron. Baldur's Gate is a near-perfect adaptation of the classic tabletop, role-playing game Dungeons & Dragons. Six separate races and eight core character classes, from which the player can create a completely original character, are available. The game world is well painted, and players are free to explore this wonderfully textured game environment in any way they see fit, all against the backdrop of a thoughtfully conceived and versatile plot. You begin the game as a young orphan living with your stepfather within the safe confines of a scholarly community. It is a happy and idyllic life until your stepfather is killed and it becomes clear that you are intended to be next. You, as the young protagonist, then set out to discover just what kind of a mess you're in. During the adventure, you recruit a number of personable allies, battle foes, delve into dungeons, trek across wilderness, solve puzzles, and complete a plethora of epic quests that are seamlessly sown into the fabric of the overall plot. The story line unfolds in response to your choices to reveal your character's true identity as well as the nature and motive of your enemies. This 1998 Role-Playing Game of the Year is a masterpiece and the standard by which all such games will be judged for the foreseeable future. Groundbreaking 32-bit graphics, 3-D sound, multiplayer options, and a friendly real-time game engine are blended with a depth of plot in a way that redefines the genre. A new chapter in the popular adventure game, based on the Forgotten Realms campaign setting, which, in turn, is based on the Advanced Dungeons and Dragons game system. Essentially an add-on to the original version of the game, this chapter asks you to continue with the character you created in the original. Baldur's Gate: Tales of the Sword Coast delivers what we've all been screaming for--more Baldur's Gate. Although it does not significantly extend the story line, it does provide enough new goodies to augment an already great game. Baldur's Gate: Tales of the Sword Coast provides four new areas for you to explore, all of which share the richness that made Baldur's Gate a groundbreaking masterpiece. Players are given the opportunity to explore a few new islands, visit a suburb of Baldur's Gate, and engage in a good old-fashioned dungeon crawl beneath Durlag's Tower. Players can also embark on a quest that will take them back into the city of Baldur's Gate itself. These new quests tend to be even more involved and challenging than those found in the initial game, as they gravitate more toward puzzle solving than pure combat. The additional areas are at least as satisfying as any found in the original, featuring three new types of monsters as well as new magic items, enemies, and spells, all of which are woven seamlessly into the game play. Those who are already deeply involved in a campaign or have already completed the game need not start over to take advantage of the expansion. Baldur's Gate: Tales of the Sword Coast raises the character experience cap by at least one level and can be integrated at any time during your campaign, easily providing an additional 20 hours of game play. For a Baldur's Gate enthusiast, the four new areas alone make this expansion worth having. An added treat is the included software utility that allows players to speak to each other online via microphone, giving multiplayer games a live role-playing feel. Baldur's Gate: Tales of the Sword Coast may tend to give you more of the same, but in this case, you wouldn't have it any other way. In Baldur's Gate (Role Playing Game of the Year, 1998), with expansion pack Tales of the Sword Coast (included in this pack), deeds are rewarded with vast treasures of legend, glory beyond compare and a world rescued from the brink of disaster! Huge game world - 5 CD's filled with nearly 10,000 scrolling game screens in lush 16-bit SVGA graphics. Gripping non-linear adventure that spans 7 chapters, with dozens of subplots that branch in and out of the main scenario. Your decisions affect subsequent chapters and the entire gameworld as a whole. Set in TSR's best selling Forgotten Realms campagin setting, the most popular of the Advanced Dungeons & Dragons roleplaying game worlds. Explore hundreds of intricately rendered and visually stunning hi-res buildings and structures: taverns, temples, houses, arenas, stores and brothels are meticulously created. Guide a party of up to five other characters, each with their own personalities and dispositions. Allows you to control party characters one at a time or as a group. Create your character from a combination of six authentic AD&D races - human, elf, half-elf, dwarf, gnome, halfling and 26 different classes - fighter, thief, cleric, mage and subclasses such as druid and specialist mage. Features real-time environmental effects such as rain, snow, lightning, and fog, day and night lighting, as well as interior and exterior lamps and magic spells. Three new world areas added to the Baldur's Gate world with the expansion - the town of Ulgoth's beard, Durlag's Tower and a mysterious island. Expand the game world with your party of adventurers from your current game of Baldur's Gate. Join up with new friends or meet old enemies - Tales of the Sword Coast works like a plug-in for Buldur's Gate. Actions in the original release impact events in the game. Numerous improvements in the interface and the game system based on fan input. More powerful spells, and additional enchanted items to be found. Roger Wilco Voice Communication - Discuss your gaming experience with your team in a far more personal way over the internet without having to interrupt your gameplay, audio or game performance. Baldur's Gate II: Shadows of Amn is the sequel to the "Game of the Year" Baldur's Gate. Having sold over 1 million units worldwide, it remains a top-selling PC product. Baldur's Gate II builds upon the success of the franchise and takes the RPG experience to new levels of high-fantasy gaming. Gameplay-enhancing features include 3D graphics support, dazzling new spell effects, improved multiplayer capabilities, subquests based on class, new classes and a new character race. 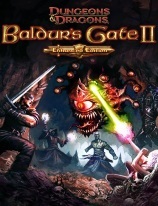 Baldurs Gate II contains more spells, weapons and monsters than any other licensed AD&D game to date. It is the continuation of the Baldur's Gate epic plot developed by Bioware Corp (MDK2, Baldur's Gate, Tales of the Sword Coast, Neverwinter Nights) and published by Black Isle Studios (Planescape Torment, Fallout 2, Icewind Dale). In Shadows of Amn, you face an uncertain future, with a lineage that tempts the unscrupulous to use you and the ignorant to fear you. You will face a foe that views you as no more than chattel and that toys with you at every turn; a villain whose goals go beyond a quest for power and who threatens to use a lost companion as a tool for unparalleled destruction. The choices to be made will not be easy, and you may have to align with the lesser of evils, even though all evils cannot help but seem equal. In the end you will have mourned lost loves, celebrated new ones, and had adventures that profoundly shaped the Realms. Baldur's Gate II: Throne of Bhaal, the add-on pack to Baldur's Gate II, expands and enriches the gameplay experience by adding several new locations, high-level spells, and powerful new characters to the Baldur's Gate II game. Set in the Forgotten Realms campaign world of Dungeons & Dragons, Throne of Bhaal is the ultimate conclusion of the Baldur's Gate legend, as gamers fulfill their destiny as the child of Bhaal, god of murder. Baldur's Gate II: Throne of Bhaal takes players through an all-new story line, rich with intrigue and treachery, as they unravel the mysteries of the Dungeon of Watcher's Keep and explore other new areas, such as the City of Saradush, the Fortified Monastery of Amkethran, Sendai's Underdark Fortress, and the player's own Abyssal Stronghold. Throughout their journey, characters may reach up to level 40, made possible with a raised experience cap of 8 million points, quite possibly the highest level ever achieved by characters in any Advanced Dungeons & Dragons computer game. Also included in the quest are more than 40 powerful high-level spells and abilities. The Wild Mage Character Kit will also be added to the already extensive class list, allowing gamers to create a powerful new character able to cast spells, with very unpredictable results. Baldur's Gate II players will be pleased to hear that Throne of Bhaal is fully playable either while questing through their BG II adventure or after they have completed BG II. Powerful high-level abilities for higher level characters. New Wild Mage character kit. In the northernmost reaches of the Forgotten Realms lies the region of icy tundra known as Icewind Dale. Journey deep into the Spine of the World mountains, a harsh and unforgiving territory settled by only the hardiest folk. Encounter fearsome beasts that have learned the cunning and ferocity needed to survive among the snow-shrouded peaks. Confront an evil that schemes beneath the carven glaciers and mountainsides to wreak destruction upon the face of FaerÃ»n. This is the world of Icewind Dale: Enhanced Edition. The original Icewind Dale, polished and perfected. The Heart of Winter and Trials of the Luremaster expansions. Six expanded quests, featuring content cut from the original game, now finished and restored. 60 new items, including new magic armor and weapons. 31 new class and kit combinations from Baldur's Gate II: Enhanced Edition (Blackguards and Wizard Slayers! ), as well as the half-orc playable race. 150 new spells and abilities carried over from Baldur's Gate: Enhanced Edition. Bug fixes and improvements too numerous to mention. Functional, extensively tested cross-platform multiplayer on all supported platforms. A new "Story Mode" difficulty setting to allow players to experience all of the story with none of the Game Over screens. Icewind Dale incorporates the award-winning gameplay elements from Baldur's Gate, offering players a chance to hone their combat skills while exploring the enormous caverns and dungeons beneath the Forgotten Realms. Players create a party of adventurers in the frigid north. They must combat monstrous cyclopses and frost giants that dwarf the player characters as they search for an evil lying deep within the Spine of the World. Icewind Dale offers character advancement from levels 1 through 15 in the most recent adaptation of AD&D rules. Icewind Dale intentionally avoids a sophisticated role-playing-game plot in favor of classic Advanced Dungeons & Dragons dungeoneering. The game is set in the frigid corner of the Forgotten Realms made famous by author R.A. Salvatore's novels. Many fantasy fans will be familiar with the popular setting, but this time you get to create the heroes, and the adventures are your own. Veterans of Baldur's Gate and Planescape: Torment will find BioWare's Infinity game engine instantly recognizable and usable. AD&D fans will be pleased with the interpretation of AD&D 2nd Edition rules. With a few exceptions (no kits, no Drow player characters, no two-weapon fighting), you can assume that if it's in the rule books it's in Icewind Dale. Players can create six characters from standard AD&D 2nd Edition races and classes as they set off to find an ancient evil buried in the Spine of the World. Combat occurs in real time (no turns), but the action can be paused at any time in order to issue new orders, prepare spells, or respond to a new threat. The designers keep combat fast by allowing players to assign an artificial-intelligence combat script to individual characters. Your party can encounter a minor monster, fire arrows as it approaches, attack it with fighters when it gets close, and then get healed by the cleric when the fighting is done--all without your intervention. Baldur's Gate and Planescape: Torment kept players hooked with an engrossing story line and, in the case of Planescape, excellent writing. Specifically designed as a more action-oriented "hack and slash" RPG, Icewind Dale relies on combat and character advancement as its own reward. While it lacks the random dungeons and incredible magic items of Diablo, the high experience point cap and the ability to create all six of your party members make Icewind Dale a worthy addition to any AD&D fan's game library.